Trends from eMarketer on US Video consumers show a growing appetite for online videos which will continue to grow further. Video viewers will continue to spend more time on watching these videos. What is striking here is that video consumption on other digital video devices are growing at a higher rate than TV, which seems to declining rather than growing. So lets take a deeper look at the other digital devices which we are talking about here. Tablet, Smartphone, Desktop / Laptop and other connected devices together constitute this digital video devices category. Looking at the above video consumption trends from eMarketer,its evident that mobile devices are almost caught up with desktops in terms of digital video consumption. In addition, there is also tremendous growth rate in tablets which indicates that they are the device of choice when it comes to mobile video devices. Mobile users globally are watching more video content than ever before. What might be more unexpected however is the fact mobile video is no longer a short-form phenomenon: users are also watching longer video clips, including full TV shows and even films. In Aug, 2015, IAB commissioned a Global Consumer Survey looking into how, when and why people around the world are viewing video on their mobile devices. On Device Research surveyed 5,000 smartphone users in 24 countries across Europe, Latin America, the Asia-Pacific region and South Africa. Frequency & Length of video Consumption: 36% of all respondents watch video of 5 minutes or more on a daily basis or more frequently. Infact in countries such as Turkey this figure rises to 60%. 58% of global respondents say they watch short videos (under 5 minutes) on a daily basis or more frequently. Mobile Video Consumption: 35% of respondents watched more video on their smartphone versus last year with U.S. (50%), Canada (42%), New Zealand (42%), South Africa (42%), and the U.K. (40%) standing out in this mobile video consumption growth compared to last year. Multiscreen video Viewing: Dual-screen video viewing is becoming ever more prevalent. 53% of smartphone video viewers across the 24 markets often or sometimes watch mobile video while watching TV. Only in Japan is this trend noticeably less prevalent. Mobile Video Channels: Apps are ahead of browsers as the access point to mobile video. 48% only/mostly use mobile apps to watch video on their smartphone as compared to only 18% who say they only or mostly use mobile websites. Reception to online video advertising: Advertising is being seen and video viewers in surveyed markets are overwhelmingly open to tailored advertising when watching mobile video. Video sharing: 68% share the videos they watch on their smartphones, and 42% say social media is a way they find video content to watch. Mobile video consumption and impact on TV viewing: Watching longer video content is also particularly popular in the US and Canada, with 30% accessing their favourite TV programmes through their mobile. Movie viewing is even more popular in East Asia; 56% of China’s users say they watch full movies on their small screen. This is having a significant impact on the amount of time mobile users are spending with their TV sets: across all regions 22% of people report watching less TV thanks to their video mobile habits. With the implications this might have for advertisers, it’s interesting to note that users are also enthusiastic about tailored ads in their video content, with a huge 82% reporting this is something they would want. The increasing popularity of mobile video may also complement TV; overall 66% of mobile viewers report seeing adverts online which they have previously seen on TV. Here are statistics from June 2014 on country-wise online video usage. 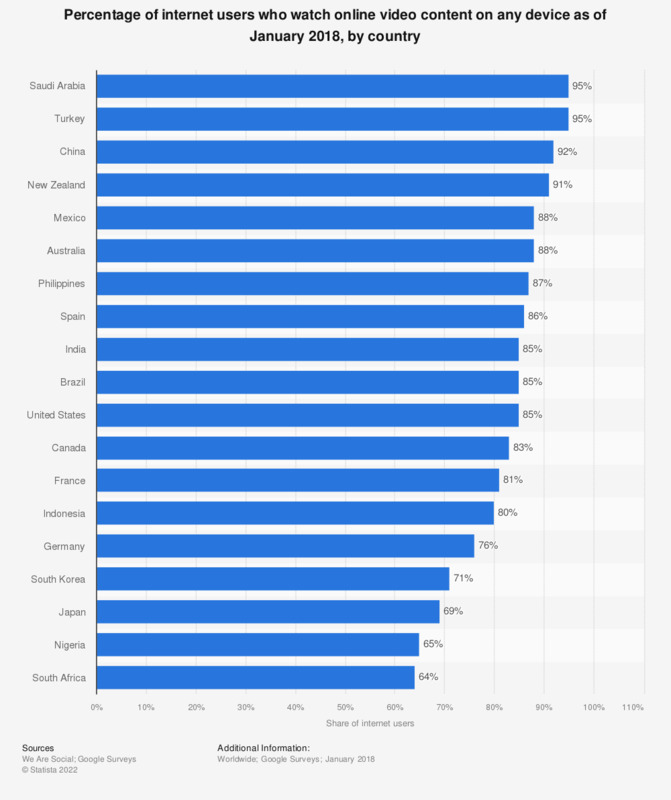 The chart depicts percentage of internet users in each of these countries who watch online video content on daily basis. Online Video: approximately 70% of global online consumers watch online video; but North Americans and Europeans lag in adoption. More than half of global online consumers watch online video in the workplace. Mobile Video: is already used by 11% of global online consumers: penetration is highest in Asia-Pacific and among consumers in their late 20s. Tablet PCs: are expanding the definition of mobile video. Globally, 11% of online consumers already own or plan to purchase a tablet PC (such as an iPad) in the next year. Television: is a universally important platform for video consumption, with connected consumers in many markets spending 4+ hours per day watching television. HDTV (High-Definition TV): is improving the TV viewing experience for as many as 30% of global online consumers. Adoption is highest among older consumers and in North America, where HD content has proliferated. 3DTV (Three-Dimensional TV): will have a small but important audience: 12% of global online consumers own or have definite intent to purchase a 3DTV in the next year. “Over the Top” TV: televisions with Internet connections are gaining interest. About one in five (22%) global online consumers owns or has definite interest in buying a television with Internet connection in the next year.